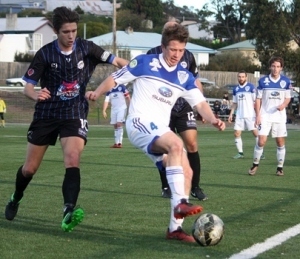 The Olympia FC Warriors showed skill and great determination as they registered an incredible come from behind victory over the Kingborough Lions. After being down in the doldrums, trailing the Lions 3-0 at half time, last year's Champions staged a comeback of epic proportions, piling in four goals in the second half to steal the victory in the 92nd minute of the game. In a pulsating encounter, Nick Mearns, Shae Hickey and Gavin Hoy ran riot and played huge parts in the Olympia comeback, whilst for the Lions, Shane Cartwright was clearly their best on ground. The day started in the blazing sunlight and finished in near darkness as the 3pm kick off tested the crowds choice of clothing. By the time it wrapped up, players and spectators alike were breathing condensation as the temperature dropped off rapidly. But the football itself was scintillating enough to bring warmth to everyone that witnessed this spectacle. Olympia started extremely brightly, hitting the bar with a header from Graham Glynn after just 30 seconds. The first 15 minutes was all one way traffic. Mearns and Hoy worked brilliant combinations that continually opened up the Lions defence, but for all of their effort and intent, the Warriors could not hit the scoreboard. The Lions slowly worked their way into the opening half after the opening blitz from the Warriors. In the 22nd minute they took a surprise lead as Damien Pearce’s long throw from the left wing went right into the mixer at the 6 yard line where the big physical presence of Cartwright acted as enough of a distraction for the Olympia defence to divert the ball into their own net. In the 29th minute a lacklustre clearance from another Pearce long throw saw the ball fall to Tom McDonald on the bounce. The midfielder lashed a stunning volley home that sent his teammates and coaching staff and most spectators into either shock or euphoria. It was certainly a goal of the year contender and helped put the Lions 2-0 ahead. In the 37th minute, more disaster struck the Warriors, who by this time, had really fallen in a hole. They looked disjointed offensively and their defence was falling apart as well. Sam Conway waltzed down the left wing past both Hoy and Jack Callan before playing a curling dipping ball to the back post. Roan Gillam couldn’t quite reach it and as he flapped at it, it distracted Zac Drake who had position himself well at the back post. With the distraction, Drake could only just manage to header the ball into the crossbar, with the rebound bouncing into the back of the net to make it 3-0. The Warriors went into half time disappointed but not completely out of the game. They came out of the break full of belief and put together a scintillating second half of football. It was all one way traffic as the Warriors kept searching for a way back into the game. The way in finally came in the 57th minute as the Lions gave away a free kick about 25 yards from goals. Hoy stepped up and hit a stunning, curling free kick that nestled in the top left corner to make it 3-1 and breathe life back into the contest. Aidan Farquhar went close in the 65th minute as the centre half tried his luck from 35 yards out with a spectacular strike that rattled the crossbar. Farquhar got the goal he deserved in the 70th minute though as a failed clearance from the Lions fell to the youngster and he lashed a half volley into the bottom left to make it 3-2. In the 78th minute it was 3-3. Jake Leaman played a raking long ball out of defence that found Hoy on the run and the diminutive winger made Joel Schuth look foolish before laying off to Glynn who slotted home into the bottom right. Mark Grace should have done better as the ball squeezed under his arms for a second week running. Both teams traded blows late as they constantly searched for a winner. But it was the Warriors who had the last laugh. In the 92nd minute, substitute Nick Meredith dinked a super little ball into Mearns who had made his way into the box. He controlled with his chest before turning two men the wrong way inside the box, bursting forward another two steps and slamming home the winner on his left foot. It was a stunning game of football that gave the spectators value for money. Goals, excitement, drama, passion. Perfect.